Just this morning I received an e-mail from a friend breathlessly warning of the dangers of impending Sharia law in America. 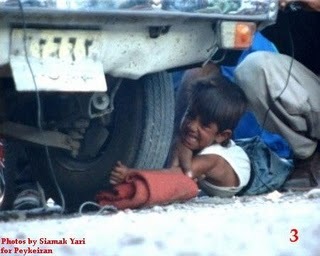 The e-mail contained a series of photos of an Iranian boy whose arm was being crushed beneath a car’s tire for the crime of stealing. Why aren’t we bombing them already? Wow. I guess everything we’ve heard about Islam and the Iranians is true. They are nothing more than barbarians that must be bombed into submission by our brave… [cue the Toby Keith song]. This looks like the exact same photographs that were circulated around the time of the invasion of Iraq that were supposed to whip us into a frenzy of loathing for the cruel, implacable Iraqis who would break a boy’s arm for stealing. The problem is that the photos are actually of a young street performer who along with his father stage this stunt for money. The boy’s arm is not broken and subsequent photos show the boy sitting amidst the crowd afterward with no physical harm whatsoever. But an alarmingly small percentage of people are willing to look beyond the initial emotional reaction to do some fact-checking. And this is how wars are sold to a gullible populace. 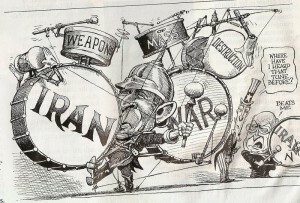 Just as a certain amount of shameless propaganda and conditioning was necessary to get Americans to believe that the invasion of Iraq was necessary, it increasingly appears that the stage is being set for a military confrontation with Iran. With tough sanctions already in place, our leaders are disingenuously claiming that all other options have been exhausted (as with Iraq) and that war is the only recourse that remains. What this means (in plain English) is that every time Iran has met the demands of the U.S. or the U.N., we’ve simply issued more demands. Let’s take a closer look at each of these claims to see–like in the above photographs–if the reality matches the emotional hype. Conventional wisdom (by which I mean whatever our modern day Ministry of Truth is telling us) holds that Iran’s burgeoning nuclear program cannot possibly be what Iran has claimed it is; namely for peaceful purposes including nuclear power and medicine. Over and over we are told that Iran is pursuing its nuclear program for the purpose of creating a nuclear bomb to use against Israel or the United States. “They could have a bomb within the next 6 months!” –read the headlines for the past few years. Besides this, every time another 6 months go by without this dire prediction coming to pass, another breathless headline is issued to stir our fears anew. Strange how the details that Scott Horton shares somehow don’t make it into our media coverage of the alleged Iranian nuclear “crisis.” Almost as if our media serves more as a parrot than a watchdog to our government’s activities. As to the second assertion that Iran is planning to “wipe Israel off the map”, we’re going to have to use our noggins for a few minutes. The first brutal reality we must face is that the statement in question never happened. It is an example of how a lie can be repeated often enough that it takes on the appearance of truth. In this case, it is an example of how governments attempt to con their people into supporting unwarranted and unjust wars. In October of 2005, Iranian president Ahmadinejad made a speech titled “The World Without Zionism” where he is purported to have threatened to wipe Israel off the map. Ahmadinejad, though clearly no graduate of Dale Carnegie, was actually quoting the former Ayatollah Khomeini when he made a statement about the Israeli regime vanishing from the pages of time. Like most statements, it must be examined in context for one to discern what Ahmadinejad was actually saying. That passage will mean nothing to most people, but one word might ring a bell: rezhim-e. It is the word “regime.” pronounced just like the English word with an extra “eh” sound at the end. Ahmadinejad did not refer to Israel the country or Israel the land mass, but the Israeli regime. This is a vastly significant distinction, as one cannot wipe a regime off the map. Ahmadinejad does not even refer to Israel by name, he instead uses the specific phrase “rezhim-e ishghalgar-e qods” (regime occupying Jerusalem). So this raises the question… What exactly did he want “wiped from the map”? The answer is: nothing. That’s because the word “map” was never used. The Persian word for map, “nagsheh” is not contained anywhere in his original Farsi quote, or, for that matter, anywhere in his entire speech. Rather a different story when one takes the time to look beyond the hype, isn’t it? Ahmadinejad clearly has a bone to pick with the current Israeli government which he sees as the West’s tool for politically oppressing Muslims in the Middle East. But when his speech is examined in context, he is pointing out that other firmly entrenched regimes in the region have vanished from their former positions of dominance including the former Shah of Iran, Saddam Hussein’s regime, and the former Soviet Union. They are now relegated to the pages of history books. Taken in proper context, Ahmadinejad is calling for regime change and not war against Israel though as Norouzi points out, the first distortion of the Iranian president’s comments was by Iran’s own news agency. Numerous other world news agencies picked up on the misquote and without verifying or checking it against its original source began to spread the misquote which has become a key slogan for those who wish to wage war against the Persians. I’m not suggesting that Iran’s leadership is as pure as the driven snow, but having an unlikeable leader or having leaders with a bad attitude is simply not proper justification for launching yet another pre-emptive war against a nation that has neither harmed us nor possesses the material capability to do so. And a nuclear-armed Israel is fully capable of defending itself against any nation or coalition of nations who would be foolish enough to actually threaten it. A just war is one that is fought as a necessary, though regrettable, last resort–after all other means have been exhausted. It was never intended to be a method of hammering recalcitrant nations into submission. Iran doesn’t pose an imminent, unavoidable threat to the U.S. or to Israel, but our policy makers are doing all they can to convince the American public that military force is the only solution. 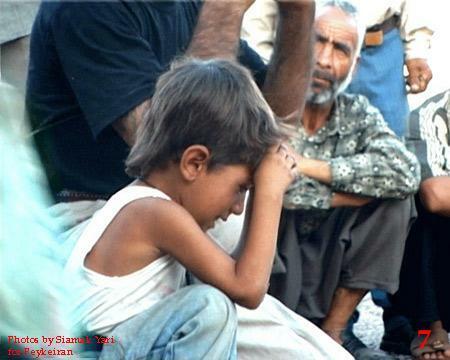 The invasion of Iraq was sold to an unsuspecting American public still under the emotional influence of the 9/11 attacks. The rationale for that war has changed many times over the past 7 years, from non-existent WMD’s to false allegations of Saddam’s ties to Al Qeda, to the patently false concept of bringing stability to the Middle East. Too many good Americans swallowed the lies hook, line, and sinker when our leaders and their ministers of propaganda beat the war drums to justify aggression against a nation that has never harmed us. 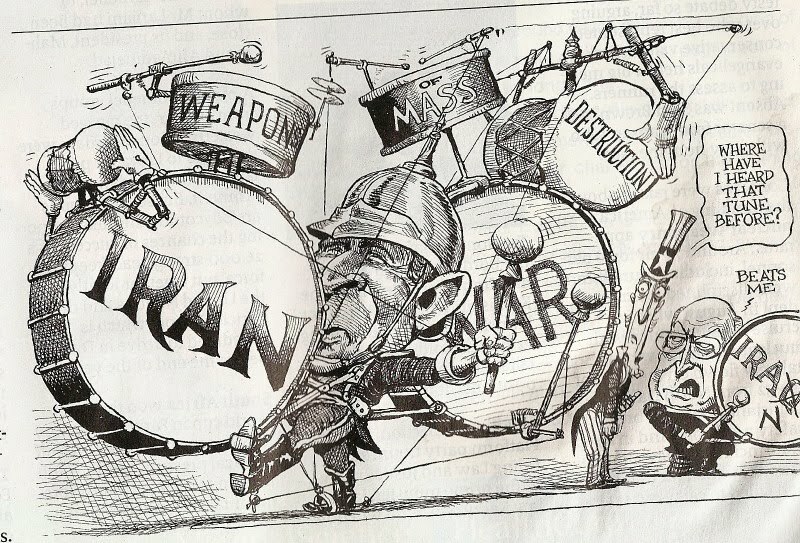 Hopefully some of those who were fooled last time will have learned enough wisdom from their mistake to recognize that we are being played for fools into supporting another undeclared, unconstitutional war–albeit this time against Iran. The first step to resisting the current conditioning for war with Iran is to recognize it for the manipulation that it is. 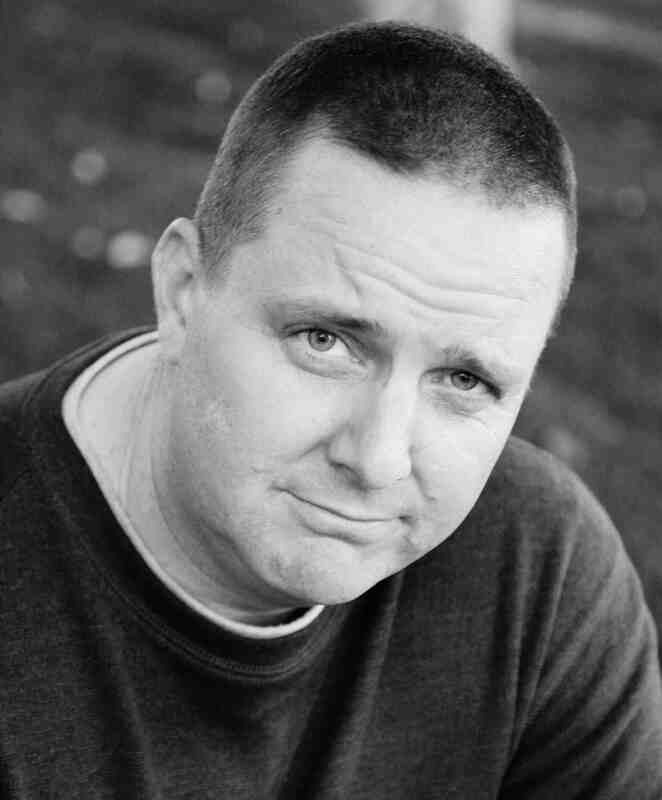 Bryan Hyde is a radio host, husband, father, graduate student at George Wythe University, and seeker of truth. He does professional voice work through his company One Clear Voice. Bryan blogs at The White Rose Society and writes firearm reviews for The Truth About Guns. He and his wife Becky are raising their six children in Cedar City, Utah. So, I think you are basically right, but we need to be open to the possibility that there is a true Iran threat–its just that it is almost impossible to get good information. I would like to read and see more on the “Iran is not so much of a threat” side.